Mars Rover Curiousity Lands On Mars — Will This Inspire Improved Funding of Science in the U.S.? In the wee hours of the morning today, NASA landed an SUV-sized robotic rover on the surface of Mars. The rover, dubbed “Curiousity”, survived a 7-minute automated landing plan — without possible input or guidance from mission control on Earth — to touch its wheels on Mars. News of Curiousity’s successful landing was confirmed when the rover began transmitting images from Mars’ surface. One of the first images of Mars' surface, as viewed from the cameras mounted on Curiousity. There’s a one-ton piece of American ingenuity and it’s sitting on the surface of Mars right now. It’s true. Not only did NASA scientists overcome several critical scientific and logistical roadblocks in landing a vehicle of scientific exploration on a planet more than 300 million miles away, but it did so in a climate of reduced scientific funding in this country. They did so in a climate of American scientific apathy, when the news cycle is more fascinated by Octomom and Kristin Stewart’s infidelity than they are in covering American scientific breakthroughs. They did so in a political atmosphere of willfull scientific ignorance, when the facts of evolution, climate change and stem cell research are questioned (if not openly denied) to score political points. And finally, NASA landed a one-ton robot on Mars despite an era of significant budget cuts by the federal government that have impacted all fields of science in this country. 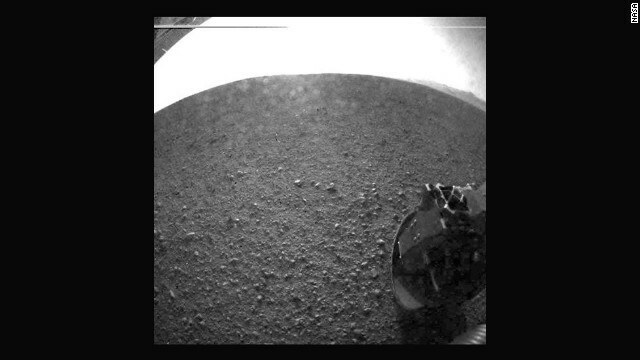 It’s fitting, to me, that the rover that landed this morning was given the moniker “Curiousity”. Curiousity — the child-like wonder that still captures our imagination when faced with the unknown — is exactly what science is (and should be) about. Science shouldn’t be weaponized, or monetized, or belong only to the privileged wealthy few. Scientific findings should belong to the public so that it can benefit and further our basic understanding of the world we live in. Curiousity and intellect are traits that uniquely defines Homo sapiens; we are literally “the thinking ape”. Science at its core is a pursuit that fulfills, and advances, the basic motivations of our species. With the ongoing trend of scientific disinterest and willful ignorance, where science takes a backseat to political maneuvering, in-fighting, and bickering, science is losing its role as a collective public good. Over the years, private enterprises — which, by definition, are driven by the profit motive — have overtaken the federal government as the primary source of scientific funding in this country. 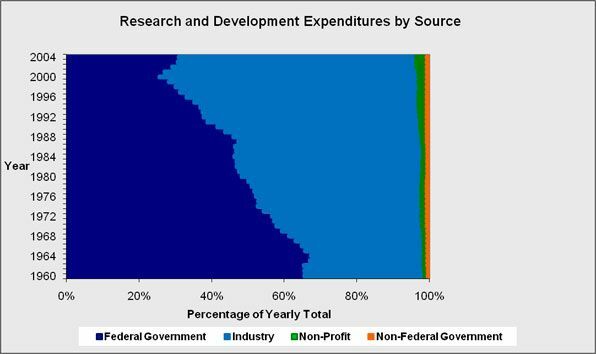 Private industry now makes up the vast majority of scientific funding sources, compared to the 1960's, during the heyday of the "Space Race". Two years ago, NASA announced that — facing significant budget cuts — it had decided to indefinitely halt manned space missions. A tradition of space missions that began with a small bootprint on the surface of the moon and a giant leap forward for all mankind, came to a close within my lifetime. Instead, manned space missions will now be outsourced to private companies, in a move that is likely to one day give birth to space tourism for rich people. Private industries can make significant headway in certain areas of science, since internal funding for individual projects can remain much more constant from year-to-year. But, in industry, several factors also limit the kinds of projects that receive funding: projects are not submitted for external peer-review prior to funding (which typically serves to improve the initial conception and experimental design of a project), and projects are funded primarily according to their likely profitability rather than for their scientific merit. And most importantly, scientific findings made by private industry are typically copyrighted; unlike publicly-funded scientists, private industry is not required to share their findings in a manner that could be expanded upon and/or benefit the work of their scientific peers. Private industries are motivated to identify new drug compounds (if not the pathophysiology of the diseases they are designed to treat), computer chips and weapons. And don’t get me wrong: these are all worthy goals that have their place in science. However, the landing of an SUV-sized rover on Mars merely to find out whether or not the planet was ever capable of sustaining life brings with it little promise of profit. One wonders if private enterprise would have ever funded such a mission. In 2008, President Obama was elected in part with the promise to improve scientific funding in this country. Depicted above are President Obama's proposed budgetary changes to the major federal granting institutions in this country. Except for the CDC, President Obama promised to significantly increase funding to almost all agencies. Unfortunately, the reality is that even under President Obama’s leadership, scientific funding has remained largely stagnant when viewed over the last several decades. Nature, science's premiere scientific journal, published this infographic showing trends in scientific funding over the last 20 or so years. Last year, NIH’s budget was slashed by $320 million (or 1% of its total annual budget), which NIH Director Francis Collins testified would likely result in the funding rate of new grants dropping from to below 20% for the first time ever. NIH success rates — the percentage of submitted scientific proposals that receive funding — is a well-accepted indirect measure of the strength of overall federal funding for the sciences. 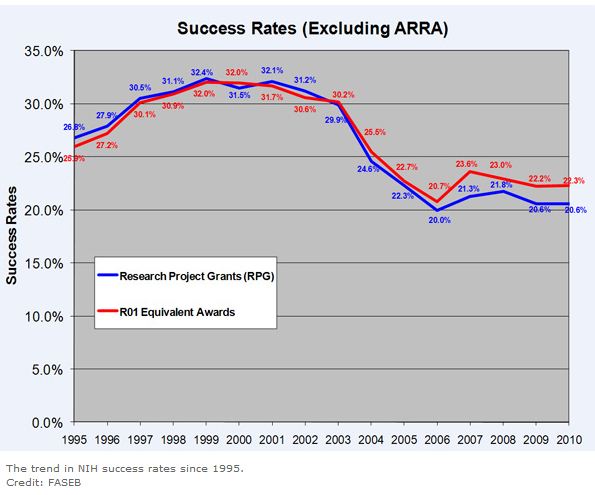 NIH grant success rates plummeted during the Bush years and show no signs of improving as Obama's first term comes to a close. The budget cuts are also anticipated to put a virtual halt to the funding of new projects next year, and we’ve already seen an impact of budget cuts since I’ve been a young investigator. Funded grants have their budgets unexpectedly slashed from year-to-year, and earlier this year, a scientific conference that received a score that almost guaranteed funding (which is used to reimburse travel costs for invited speakers) suddenly found that the agency had its funding source suspended, resulting in a desperate last-minute scramble by the conference organizers to secure sponsorships from private industry just weeks before the conference’s scheduled start-date. Scientific funding through the National Institutes of Health (NIH) is at an all-time low, and funding for FY13 is expected to remain flat. Devastating, automatic cuts in federal government spending are set to go into effect in January 2013. This action called sequestration resulted from the failure of Congress to agree upon a deficit reduction plan in 2011. 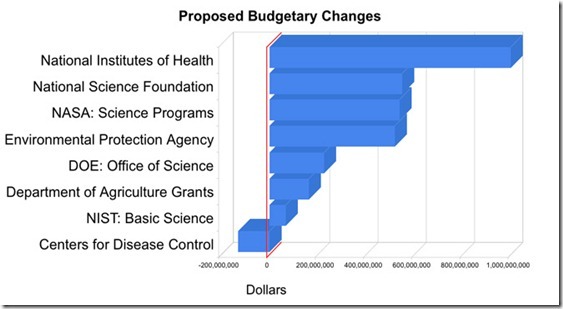 In the event of sequestration, NIH could face an additional 8% funding cut. This could mean a reduction by a quarter in the number of new and competing renewal grants funded by NIH in FY13. Click here for more information on sequestration. The fact that funding of science by America has plummeted over the last decade is a significant indication that science — as a field — is floundering in this country. Lack of proper scientific funding will severely hamper not only the very act of scientific pursuit, but the quality of the science that will emerge for years to come. I’m already seeing the first impacts of the bleak funding outlook for scientists: faced with the low income of most scientists (most of us doctorates can look forward to making about as much money as a manager of your local fast-food joint for several years after graduating) and the growing difficulty of getting new grants funded (the bread-and-butter of young up-and-coming investigators), more and more gifted scientific minds of my generation are leaving public science for private industry jobs, or are leaving science altogether. The impact of this hemorrhagic exodus of young investigators away from science is virtually unpredictable, but is almost certain to impact America’s already poor scientific and educational standing worldwide. So, today, NASA landed a Mars rover on Mars. And, yes, this is a testament to American ingenuity, and another leap forward for mankind’s scientific understanding of our neighbouring planets in the solar system. But, as Curiousity continues to transmit new images from the surface of Mars, I urge us all to not just celebrate this individual achievement. This breakthrough didn’t happen in a vacuum; it is made all the more astounding given the political obstacles that NASA scientists faced in making the Curiousity mission a reality. As we move forward from today, I urge all of us — scientists and non-scientists alike — to draw a line in the political sand. Curiousity cannot just be the name of an isolated unmanned scientific mission to Mars. Scientific curiousity should remain a defining characteristic of our species, one that remains strong due to constant political and economic support by our leaders. My parents watched the first manned space mission to the moon, only to have their children witness the ending of manned space missions. I hope that I didn’t just witness one of the most ambitious landings of an unmanned robot on Mars, only to have my children witness the further deterioration of scientific pursuits within their lifetime. Act Now! The Coalition for Life Sciences website has a great tool for identifying and contacting your political representatives on the topic of improved scientific funding. You can also write a letter to the editor in your local newspaper, and come November, remember that it is members of the Republican party that, right now, is permitting the automated budget cuts next year that will slash scientific funding. If you’re a Democrat or Independent, I urge you to vote Democrat; if you’re a concerned Republican, I urge you to contact your Republican candidate and encourage them to protect funding of the sciences. Posted on August 6, 2012 August 6, 2012 Leave a comment on Mars Rover Curiousity Lands On Mars — Will This Inspire Improved Funding of Science in the U.S.?